well, my etsy shop has been open for a full four days now, i haven't even listed a quarter of what i have lying around ready to go, and yet i somehow managed to convince myself that i could play around with making some new stuff so yesterday i spent a good few hours with a bit of paint and my sewing machine. i had two pairs of jeans that were destined for the op shop but the denim just looked so nice, comfy, soft and worn, i couldn't let them go. 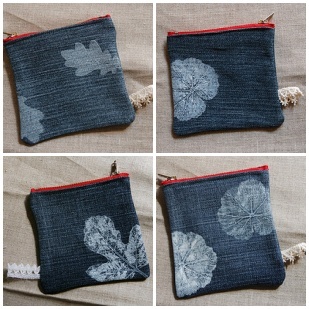 i managed to score 100 14cm red zippers at a thrift shop before christmas and instantly i could see little denim pouches with white leaf prints and bright red zips. they turned out almost exactly how i had them in mind, although i thought the white paint would be a bit more opaque, not so ghostly. it's FUUUUUUNNNNNNN to make new stuff! and to have a place to put them while i move onto something else - these are now in my shop. best of luck with the shop. The pouches look fabulous!! Ditto on the pouches and I have to agree wholeheartledly about making new stuff!